Anuszkiewicz was commissioned in 1976 to create an image for the Montreal Canada Olympic Games. Richard Anuszkiewicz American, born 1930 As a student at Erie Technical High School, Richard Anuszkiewicz took art classes every day from Joseph Plavcan. He attended the Cleveland Institute of Art on scholarship (B.F.A. 1953) and won a Pulitzer Traveling Fellowship his final year that he used to study with Josef Albers at Yale University's School of Art and Architecture. Attempting at first to reconcile Albers' color and compositional theories with the realism he had been practicing since high school, he eventually focused on abstraction. After Yale (M.F.A. 1955) Anuszkiewicz continued to paint while attending Kent State University (B.S. in Education, 1956). He was given his first one-man exhibition at the Butler Institute of American Art in Youngstown, Ohio in 1955. In 1957 Anuszkiewicz moved to New York and worked at the Metropolitan Museum of Art for awhile, repairing scale models of classical Greek architecture and sculpture, then at Tiffany and Company (1958-1959), designing miniature silver animals. He also traveled extensively in Europe and North Africa during this period. Anuszkiewicz' first one-man show in New York was held at the Contemporaries Gallery in 1960, from which Alfred Barr bought a painting for the Museum of Modern Art. By mid-decade, Anuszkiewicz's work had been featured in such seminal exhibitions as Geometric Abstraction in America (Whitney Museum of American Art, 1962) and The Responsive Eye (Museum of Modern Art, 1965). 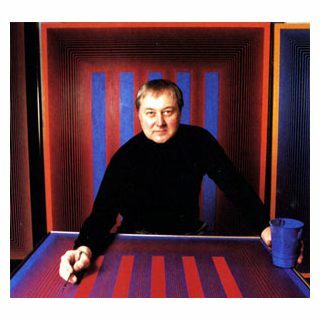 The latter helped secure his reputation as a leading proponent of the American "op art" movement in the 1960s. In keeping with Albers' Bauhaus sensibility, Anuszkiewicz undertook various commercial projects, including the design of playing cards, banners, serving trays and even a painted fur coat. In 1972 he designed outdoor murals for a YWCA building in New York City and an office building in Jersey City.